Legacy services such as X.25 are still in use worldwide for a range of applications. Over the years, many customers have made significant investments in equipment and processes that depend on X.25 and specific features the service offers, making it difficult or disruptive for them to move to alternative services. Meanwhile, operators are finding it increasingly expensive to maintain such legacy services, as the support costs for maintaining obsolete equipment grows. Ideally, they would like to retire the legacy networks completely, migrating all customers to an IP service, with lowest overall cost. However, customers for whom it is difficult or disruptive to migrate will be left with very large bills, and possibly be driven to alternative IP-only service providers. In desperation, some carriers have been running X.25 networks unsupported, with well-publicised network outages as a consequence. What is needed is a means of replicating the X.25 service, including all of the X.25 features used, over a low-cost, fully supported IP infrastructure. This will allow carriers to continue providing existing legacy services, eliminating customer disruption and alienation, while slashing the cost of providing the service. Virtual Access offers solutions where all X.25 services and access possibilities can be replicated on a modern IP network, with fully supported equipment. Disruption of customers' services is minimised and equipment replacement eliminated; while additional access methods allow combined services to be offered, as well as a simple migration path to All-IP when the customer is ready. Unlike other solutions, Virtual Access offers complete replication of all X.25 advanced features, not just transport. The heart of the service is based on the Virtual Access AlwaysOn Server (AOS). This product provides the intelligence needed to support X.25 switching, routing and facilities. The solution maintains the X.25 service presentation to the customer device, but service delivery can be over xDSL broadband, Ethernet, E1, leased lines, ISDN-D channel or dial access. This allows all existing X.25 customers to be supported using their existing access method if minimal disruption is desired. Alternatively, they can use broadband access, enabling the provision of additional services over the same connection. The solution is built from three main components: the AOS; the Service Managed Gateway; and Activator. The AOS connects to the IP network and directly replaces existing public X.25 networks supporting both traditional leased line, ISDN, dial and IP access. The AOS is built on stateof-the-art server technology and provides a modern flexible architecture that enables low-cost service delivery with minimal operational resources. The AOS can act either as an X.25 POP, directly terminating leased lines to the customer site, or as an X.25 server located somewhere in an IP network. In the latter case, a low-cost Customer Premises Equipment (CPE) - the Virtual Access SMG - is used on the customer site to transport X.25 connections over broadband IP access. These modes of operation can be used simultaneously, depending on customer needs. The AOS is responsible for providing switching and all the features of the X.25 network that customers may be using. The SMG CPE provides the physical interface and transport protocols for leased line, async, dial and ISDN access over broadband, 3G, G.703, or PSTN connection. This allows simultaneous delivery of X.25, IP and other services to the customer premises over a single line. The Virtual Access Activator system provisions the SMG/AOS and provides an OSS interface to other systems. It also assists in the migration process from the legacy network to the new one. The diagram below shows the delivery of X.25 service using a variety of access methods. The old X.25 switches have been removed and the IP network is used for core transport and also for customer access in those cases where service delivery by broadband is required. In other cases, delivery by existing leased line, dial, or ISDN networks is accommodated. The following examples are access options for moving the X.25 service to the Virtual Access solution. The methods have been used successfully in past projects and Virtual Access can project manage the migration. This solution can be used to replicate the X.25 network and services using the exisiting customer access method, usually dedicated leased lines. In this case, no customer site visit is required. Some re-organisation of the TDM network to make use of high speed access into the AOS will allow reduced hardware costs. The existing leased line circuits are connected to the AOS, either using low speed interfaces or after being aggregated on to a channelised E1. No customer site visit needed. The number of AOS systems used is determined by redundancy and network architecture considerations. Interconnection between AOS systems is normally through IP. Reduced core hardware costs. Reduced number of POPs. The AOS management, billing and provisioning systems connects to the AOS over IP Advanced management capabilities, simple migration of users. Note: The AOS can directly terminate V.35, X.21, V.24 leased line interfaces, as well as channelised E1 for low-cost aggregation. Optionally, some or all customer sites can be upgraded to use broadband access technologies. The Virtual Access SMG is used on the customer site, which provides the X.25 service interface, as well as a variety of IP services such as VPNs and VoIP. The upstream broadband connection can be DSL (the SMG has a built-in modem), Ethernet or other technologies. The SMG also supports redundancy and load sharing via MLPPP. An SMG CPE is placed in the customer's premises to convert the leased line to xDSL/3G/G.703. SMG is able to handle multiple service types. The SMGs are connected to the network over IP. Leased lines can be removed. High speed IP access is supported. Allows more services: VoIP, Ethernet over the same access. Makes most use of low-cost IP network. 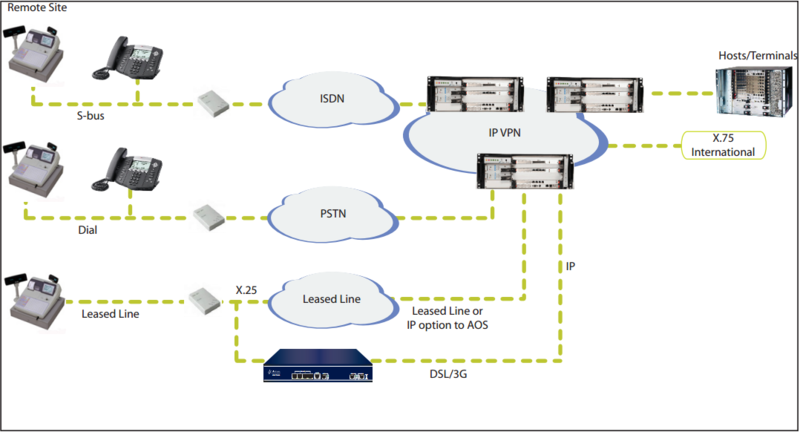 AOS can support a mix of IP and legacy leased lines. Customers can be migrated to Broadband access over time. Many existing terminals, especially EPOS and ATM terminals, use X.25 connections that are delivered over ISDN lines. The new network can accommodate this by connecting the AOS directing to the ISDN network, using it to concentrate the many low-speed connections a high speed connection to the AOS. However, many carriers will want to turn off the ISDN network in the near future. In this case, the SMG can replicate the ISDN interface to the terminal device and yet deliver the service to the customer site over IP. This bypasses the ISDN network completely but allows customers to retain their ISDN interface. Other services, such as alarm monitoring, security and low-volume transaction machines, use dial access to an X.25 service. Typically, the devices use asynchronous mode over the PSTN to a PAD at a central site. This function is replicated in the new network by providing dial access to a modern RAS, which is then connected to an AOS. The AOS then provides the PAD and X.25 functions. The SMG supports ISDN connectivity over IP. 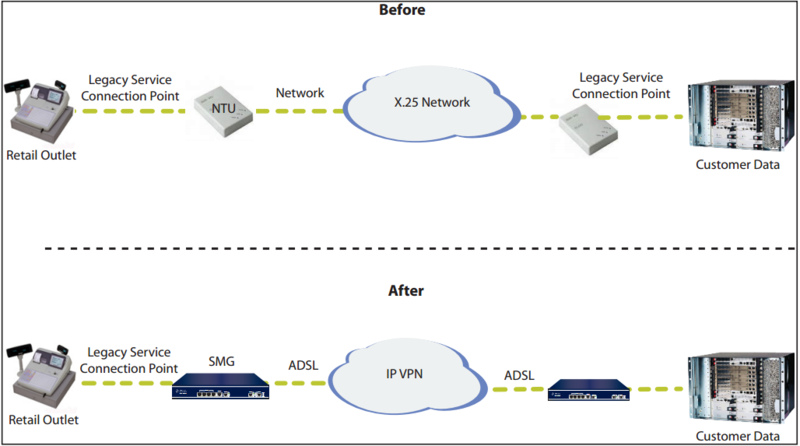 Existing X.25 ISDN devices can be migrated to IP broadband access. Flexible AOS configuration. 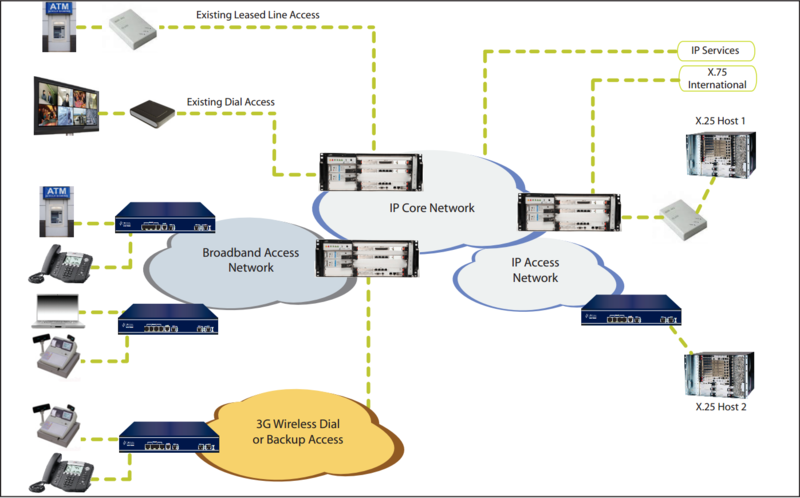 Network can handle a mixture of access technologies. Dial access supported at AOS (via RAS) Preserves service to existing dial in users. Dial in to RAS Reduced equipment count. 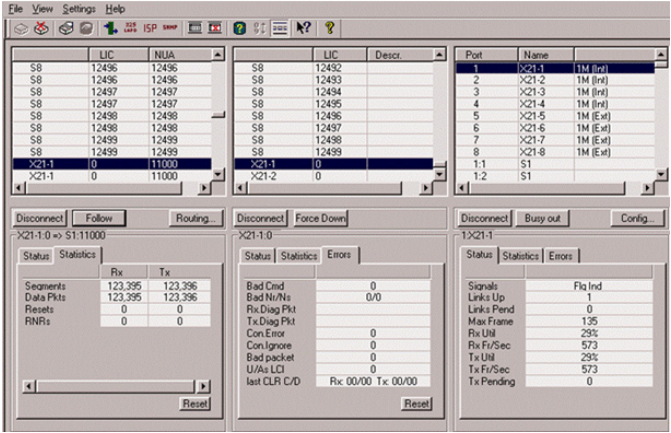 The AOS can be monitored using an SNMP manager and a Microsoft Windows-based GUI. The SMG supports a number of monitoring interfaces such as SNMP, Syslog, and email. An optional Monitor program is also available for the SMG that provides up and down status display, advanced diagnostic tools and real-time system utilisation reports. The OSS Integrator plug-in provides an interface from the Activator into the service provider's Operational Support Systems (OSS). This enables a complete flow-through provisioning solution from customer order to device installation. Integration technologies include structured text: CSV/TSV, XML, SQL and HTTP. Migrating legacy subscriber information can be costly and error prone, but the Activator OSS module helps to automate the migration of legacy subscriber information. The AOS provides billing support with call data records stored in a CSV format. Virtual Access products enable ATM, credit card, lottery, utility, security, and other services to securely and reliably connect remote site terminals to central hosts for authentic, validation, configuration, and maintenance. The IP platform enables the service provider to deliver secure, reliable services over a variety of interfaces. Support staff have access to a management portal, which enables them to place service requests, to perform first-line support tasks and to monitor the status of installed appliances, 24 hours a day, 7 days a week. The Monitor portal, coupled with localised information, captured by each CPE appliance, offers a ready-made platform for delivery of proactive availability monitoring and network utilisation reporting. In cases where carriers prefer to minimise their involvement in the problem of continuity of delivery of legacy services, Virtual Access offers an outsourced option. Many alternative approaches can be considered, including Virtual Access taking over the existing legacy network, organising and overseeing the migration to IP, and then managing the final network as a turnkey project. Please contact Virtual Access for more details. 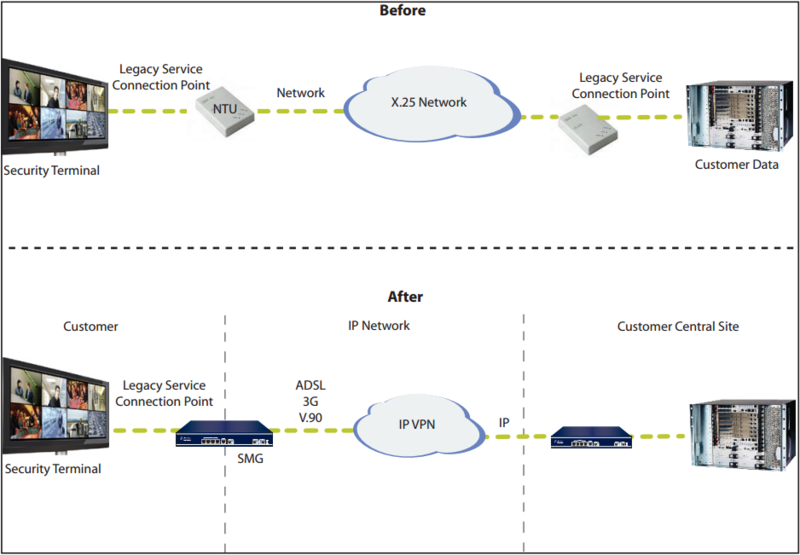 The solution converted the legacy network to IP. The Virtual Access solution proved to be a match for the high criteria requirements and has proven to be an improvement on the legacy platform by meeting the tight reliability and service level requirements of the customer. NTT moved over 200,000 X.25 customers from the old X.25 platform to the Virtual Access platform. The system currently has over 200,000 live X.25 customers and is growing. TeliaSonera provides an X.25 network used for security, emergency services, credit card and financial transactions. TeliaSonera are turning off their Nortel platform and moving customers to the Virtual Access platform, which provides the same service over a modern IP infrastructure with less equipment. The Virtual Access solution maps the legacy terminals to an IP address and encapsulates the data in IP for transmission over the IP network. The facilities provided by the existing service are maintained along with providing the IP services of the Virtual Access CPE (SMG). The SMG Activator has a profile that maps the virtual IP address of the local terminals to the corresponding legacy link identifier. Telstra provides a network used for EFTPOS, loyalty cards and health card transactions. These are high value customers that must have high reliability and are important to Telstra and its financial services customers in particular. Telstra were discontinuing the Nortel DPN platform and needed a way to maintain service to customers. The Virtual Access solution enabled Telstra to maintain service over a modern fully supported IP infrastructure without disruption to the end customers. The Virtual Access solution was integrated with Telstra's network management, billing and OSS/BSS systems. AOS multiplex 4095 VC in to one TCP session. SMG multiplex multiple VCs in to one TCP session. One TCP session of one VC. Good for small scale enterprise deployment. Does not automatically extract and use existing records. Each customer has their own private network.